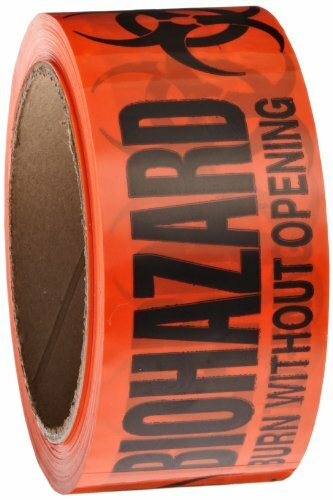 The Roll Products 142-0007 PVC film biohazard warning tape is a fluorescent red roll of PVC adhesive tape with the text "Biohazard - Burn Without Opening" and the international biohazard warning symbol to mark trash cans, sinks, sharps containers, and other biohazard locations. This tape is 2.5 mils thick, 2" wide by 55 yd. long, and comes in a roll with a 3" diameter core. PVC (polyvinyl chloride) film tape is stretchable and corrosion-resistant. The warning text and image are printed in black against a fluorescent red background for high contrast and visibility. This fluorescent color, Pantone Matching System (PMS) 805, has an orange tint, and is much brighter than it appears on a computer display. This pressure-sensitive self-adhesive tape is also suitable for sealing or marking boxes, packages, or containers that contain biohazardous materials. Roll Products manufactures tape and label products for libraries, schools, laboratories, and medical facilities. The company, founded in 1976, is headquartered in St. Marys, KS. If you have any questions about this product by Roll Products, contact us by completing and submitting the form below. If you are looking for a specif part number, please include it with your message.